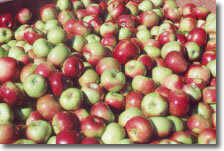 More than twenty five years ago, folks in Wellesley, Ontario decided to hold an autumn festival that would promote the community and showcase a number of local products, namely apples, apple butter, cider and cheese. The first year was so successful it became an annual event. Today, Wellesley Apple Butter & Cheese Festival, held every year on the last Saturday in September, is one of the premier autumn street festivals in Ontario. As this one day event is all about food, visitors arrive with hearty appetites and coolers to take home some local specialties. Some of southern Ontario's best farmland surrounds picturesque Wellesley village in the upper valley of the Nith River. Its rural location away from the hustle and bustle of more well- known tourist areas, makes it an the ideal place to visit. The thirty minute drive west of Kitchener-Waterloo on the popular Cultural Trail, passes well-kept farm operations, many belonging to Mennonite and Amish families. Signs caution to drive carefully as roads are shared by horse drawn vehicles. Farm-gate shopping is a way of life in this agriculturally significant area. Roadside signs advertise such delights as cooked cheese, shoo-fly pie, apple butter, eggs, summer sausage, pork, home baking, quilts, harness and Mennonite furniture. Wellesley's heritage springs from predominantly Germanic roots. Its location in the original Clergy Reserve known as the Queen's Bush, made it an important stop for settlers during the nineteenth century. Wellesley's historic area has some fine examples of early architectural styles including several buildings that obviously were used as inns. 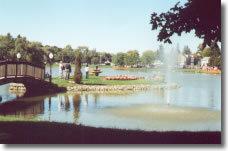 One of the village's prettiest attractions is a mill pond located in the heart of the community. The pond plays a big role in festival activities, as do main and side streets, the arena and community centre. Because Wellesley's festival is a popular event, parking can be a hassle. Its best to follow signs and take direction from volunteers who man various intersections and parking lots. The village is so compact, you can easily walk from one area to another. Attractions are well signed and you can't get lost on village streets. The sun was just peeking over the horizon when we set out for the tidy village. By the time we arrived, parked in one of the church lots and walked the short distance to the street Mall on Queen's Bush Road there were already scores of people seated at picnic tables, enjoying a hearty breakfast of sausage, pancakes with a side order of applesauce and coffee, juice or milk. Volunteers start slinging pancakes at 7:00 a.m. As there's lots to do and see, be sure to pick up an official programme at the information booth on the Mall and plan your strategy over breakfast. Right after breakfast, it's a good idea to head for the arena where a large market has been set up for the day. Best selection is found early. This is where coolers really come in handy. Vendors offer homemade baked goods, jams, jellies, pickles, meats, cheeses, apple butter and cider and a full range of hand crafted items. Be prepared to stagger back to your vehicle, arms full of fresh produce and other goodies. Back at the Street Mall, entertainment begins around 9:15 a.m. on the East End Stage. A variety of local performers and entertainments are provided until around 2:00 p.m. after which the stage is used for the popular Quilt Auction. Quilts are especially made for the festival and displayed in the Fellowship Hall on Henry Street prior to the sale. Fellowship Hall, only a block from the Mall is also home to crafts demonstrations such as paper tole, apple wreaths, wood carving, quilting, pottery making and bonsai. Menfolk love cruising the antique cars, trucks and farm machinery displayed behind the Fellowship Hall and Public Library. Weather permitting, a parade of vehicles winds its way around village streets, beginning at 12:00 noon. 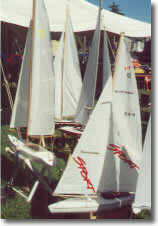 Another popular event is the day long horseshoe tournament which starts at the arena around 9:30 a.m. and features more than one hundred teams from Canada and the U.S.A.
Be sure to browse the mini-market and old time demonstrations such as soap making, on Molesworth Street before heading to the Mill Pond to see the Miniature Boat Regatta. Scale replicas of boats and flying aircraft are intricate works of art. The best are on display in Wellesley. The bank of the mill pond is a great place to relax with cold drink and schnitzel-on-a-bun to watch the radio-controlled craft skip across the water. Although you can walk to A.W. Jantzi's Apple Butter & Cider Mill, its best to take the wagon. Wagon tours load at Wagner's Garage, just around the corner from the information booth on Queen's Bush Road . It's a free ride and fun for everyone. Tours of the mill are informative and you get to taste some great Ontario cider. A. W. Jantzi has been in business since 1922 and makes a good product. You'll learn that the best cider is made from a blend of four - five different apple varieties and that no sugar or other sweeteners are used by Jantzi's when making cider and apple butter. While waiting at the garage for the wagon, you'll be entertained by people like Honky-Tonk man, Dave Hoy. Free wagon tours are also given to local farms, Llama and Arabian Horse operations being several popular yearly locations. Hop over to the Community Centre on Brown Street by the arena for a delicious Smorgasbord. The spread begins at 10:30 a.m. and includes all you can eat Waterloo County favorites such as roast beef, spareribs, pigtails, salads and home-made desserts. It's those home-made desserts that do one in! If you haven't the appetite for the smorgasbord, cruise the Street Mall and choose from any of the local food specialties being served up by volunteer groups. 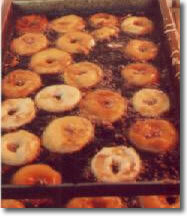 Apple dumplings, apple pie, apple fritters and cider are favorites. You can also fill up on sumptuous sausage-on-a-bun - ask for a helping of home-made saurkraut. Schnitzel-on-a- bun and barbecued chicken are good too. It's nice to know that all monies raised by the festival are turned back into community projects. Keep that in mind as you munch on a calorie-laden apple fritter. For children, the festival holds a mini-tractor pull that begins after 9:00 a.m. Consent forms are available at the information booth. The Farm Toy Show & Sale, located under the picnic shelter at the Arena Complex, is a big family draw as are clowns, puppet show, stagecoach and pony rides. Children love a ride on the pride of Wellesley, the Kelterborn Carousel. This old-fashioned full size musical carousel is located on the grounds of Pondview Village on Queens Bush Road and runs every Saturday, weather permitting. It is especially busy on festival day. Visitors to the Festival often spend several days in the area so that they can visit other small communities in Waterloo County. There is excellent accommodation in Elmira, Kitchener and Waterloo. The tiny crossroads community of Millbank is a favorite destination with its quaint c1900's main street. Millbank Cheese Factory Outlet is a great place to pick up quantities of good product. Privately owned Zehrs Country Grocery, on Millbank's main street, still has the post office tucked into a back corner of the store. Across the street, the old-fashioned hardware store is chock-a-block full of hard-to-find items. Everyone stops for a meal at Anna Mae's Restaurant. This Mennonite owned eatery and bakery is advertised as "a place where friends and family meet, for meat, potato and dessert to eat". Broasted chicken, home-made pies and cheese cake are specialties of the house. Please note that Anna Mae's is not open Sunday or Monday and does not take credit cards. Other local communities worth exploring include Linwood, Crosshill, Hawksville and Heidelberg. While in the area, Linwood and Wallenstein general stores, and Martins Dry Goods just outside Hawksville are well worth a visit. Martin sisters Bakery in the "blink-and-you'll-miss-it" Yatton crossroads is the place to buy cookies and home made bread. Invest in a good Waterloo County map so that you can enjoy a leisurely tour of back roads and by-ways. The landscape and peoples of Waterloo County portray a gentle rural lifestyle that is fast disappearing in southern Ontario. Visit soon!